← Joseph Kent Has An Idea to Effectively Use those “Old Discs”!! Al Dronsfield congratulates Earl Ball for his great accomplishment. As Earl just posted, his journey has just ended, yes he has reached his destination in the history books. Certainly his journey is full of great memories. Long before my time he recently told me, while playing in Deland that it was that tournament 19 years ago that he had partnered with Stan Williamson and made instant pro. The journey began and after playing I think 14 years with Stan and they gobbled up one victory after another he was well on his way to his destination. Eventually partnering up with Henry Strong, the journey continued, no looking back, full speed ahead. Earlier this season Earl and I were between match’s had time to chat and I could see the fatigue in him, a warrior still but labored for sure however many battles left in him. As we chatted he was not sure what was left and he commented he had, had at stellar professional work career, and now, a glamorous and stellar professional shuffleboard career. He said he was blessed, truly he has been. A thought came to my mind thinking back last season as I had played Earl for the State Singles title at Hawthorne. 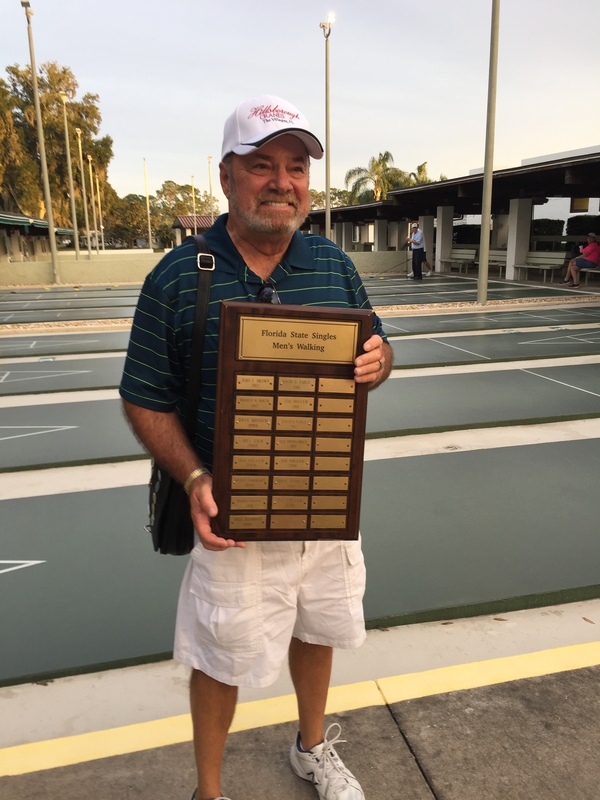 I beat Earl in the finals, and after awarding me the plaque I looked at all the legends names on it and was told I had just joined them, an honor for sure, I noticed two names not present on that plaque they were Stan Williamson and Earl Ball, can you believe this??? I told Earl I had a new direction for you, your name is not on that singles plaque your not finished yet. Having been part of Earl and Henry’s recent struggles the last few weeks it was inevitable his day would come. They say a woman’s work is never done, I don’t think Ruth Brown’s task of playing this one with Earl was in that equation, but great job Ruth and what a rewarding position to have been in. As I look over the Master’s points list and being that most of us are at least 65 and older it’s likely we may never see another green jacket awarded in our life time. What a stellar journey it has been Earl and best of luck towards what is next. Allen Dronsfield. 2017 11 22.